What film directors should keep in mind when adapting the classic adventures. 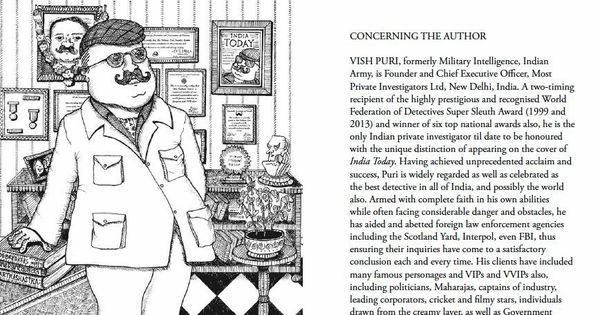 If there ever was a Calcutta winter meant to be steeped in detective fiction, then this was it. The days alternated between cold, mirror bright with a rare dry nip in the air and early morning misty fog deepening into gloomy grey damp – the first ideal for enjoying a detective thriller with your back to the sun, the second to gaze at and imagine atmospheric murders in. True to form, the run up to Christmas and the New Year brought with it a bonanza of detective thrillers in the movie halls, all running to packed houses. But I am not here to talk about the resurgence of the detective thriller. Just the one man: Byomkesh Bakshi, seeker of the truth. Byomkesh Bakshi and his chronicler Ajit are Saradindu Bandopadhyay’s vernacular answer to Arthur Conan Doyle. But apart from a few early plot influences, the similarities end there. Byomkesh’s only addiction is smoking, he has no musical ear to speak of, but like many modern young Bengalis of the time, he has a solid grasp over Bengali literature and a working knowledge of the Sanskrit classics, from which both he and Ajit quote freely. Unlike Sherlock, Byomkesh falls in love, gets married and starts a family. It is Ajit who stays on as the bachelor friend, becoming a brother-in-law to his wife Satyabati and an uncle to Byomkesh’s son. For all the outward conformity of his personal life, however, Byomkesh’s cases peel the layers off a ruthless, wild underbelly of society. Refreshingly, though, there is no air of moral preaching in the detective. His responses can sometimes be called compassionate. One cannot say the same for Sherlock Holmes. The books are written in classical Bengali and are a linguistic feast, yet the mood is clearly that of noir – fast, gripping, uncompromising in their portrayal of violence or lust, with touches of wry humour. There are thirty two stories in all. Byomkesh gradually ages over time in them. We get a sense of the roundedness of all the characters through this continuity, for the stories don’t focus on the detective’s personal life except for a line or two. Yet, these nuances successfully make up a layered picture of a man who endures in our collective memory since he first appeared in print in 1932. In 1967, Satyajit Ray directed Uttam Kumar as Byomesh in Chiriakhana (The Menagerie), one of his most debatable films. It is said that Saradindu Bandopadhyay was deeply disappointed when he saw the film. A mediocre adaptation followed in 1974 – Shajarur Kanta (The Porcupine Quill) and was soon forgotten. Byomkesh would have remained a Bengali obsession but for his outing on Doordarshan, when Basu Chatterjee introduced a note perfect Rajit Kapoor and KK Raina as the detective and writer duo. For all its frugal production values, the actors shone through. The 45-minute length of the cult series suited the format of the stories just so, and a new generation of Byomkesh Bakshi addicts was born. Raj: Very good, Bernadette. You are a regular Byomkesh Bakshi. Bernadette: What is that, like, the Indian Sherlock Holmes? Raj: Or is Sherlock Holmes the English Byomkesh Bakshi? ‒ The Big Bang Theory, 2014. Come the new millennium, and there is a veritable Byomkesh pandemic on the small and big screen. 2004 and 2007: Two television series. 2009: Magno Mainak, feature film. 2010, 2012 and 2014: Abir Chatterjee as Byomkesh with Saswata Chatterjee as Ajit in Anjan Dutta’s commercially successful adaptations of Byomkesh in Bengali. 2013: Rituparno Ghosh’s Satyanweshi, with Sujoy Ghosh as Byomkesh and Anindya Chatterjee as Ajit. 2014: Doorbeen (Binoculars), an adaptation with Soumitra Chatterjee as an aging Byomkesh, yet another TV series. Coming in 2015: The Porcupine Quill (again) with an ageing Byomkesh played by Dhritiman Chatterjee, directed by Saibal Mitra. And, of course, what could be the biggest of them all: Dibakar Banerjee’s forthcoming adaptation, with Sushant Singh Rajput in the lead role, to be released in April 2015. I have seen most of these, some with genuine enjoyment, some with a grim masochistic determination. The perfect Byomkesh adaptation still eludes me. Which brings me to my pet peeve – with all this wealth of material, why is the perfect Byomkesh adaptation still not here? Here are my grouses as a bonafide Byomkesh nerd, in no particular order. No pressure, Dibakar. Byomkesh is young and ages gradually. He is fair, moderately good looking, amiable and according to his chronicler, Ajit, looks intelligent. That is the killer. In an effort to look intelligent, too many actors portraying Byomkesh glare intently at the camera and frown for no apparent reason, taking ages to say the most mundane things, as if uttering profound truths. Leave that for that one moment, guys – the revelation of the murderer. Byomkesh is also a detective and leads an active life – please let him be thin. Uttam Kumar was probably the most miscast of the lot. We liked our heroes well rounded in those days – that’s all I shall say on the subject. Unlike Holmes, Byomkesh did not don outlandish disguises. The needless addition of two such disguises in Ray’s The Menagerie left me spluttering. It must have broken the author’s heart. Byomkesh wore a dhoti in the days when dhotis were the chinos of the urban middle class professional Bengali. No, he didn’t wear it in the decorative style of the dandified Bengali bhadralok of celluloid. He wore it tied simply, with socks and shoes, and he owned it. Any Byomkesh holding his dhuti tentatively like it a dangerous weapon has failed in this crucial aspect. Rajit Kapur owned the dhuti like no Byomkesh has. Byomkesh speaks fluent Bengali all the time. Whether a Bengali or a Hindi adaptation, good diction is crucial. Once again, Rajit Kapoor and KK Raina are note perfect. Halting Bengali and incorrect diction, as I have seen in some of the current adaptations, grate on the ear. For all the grimness of his profession, Byomkesh is a pleasant person. A smile with a bit of a dazzle is a must. Bonus points for sharp cheekbones. Sushant Singh Rajput looks rather good as Byomkesh in the promos, except for one shot where he is holding his dhuti too gingerly for my liking. Abir Chatterjee looks the part and is coming into his own. But Rajit Kapoor, for my money, is Byomkesh through and through. Too many Ajits stare doglike at Byomkesh in mute admiration too early on in the story. Here is my tuppenceworth to directors on casting the faithful Hastingses, Watsons and Ajits of detective fiction - please remember that they are first and foremost, close friends of the detective. There is a camaraderie that is mutual, an equality despite the intellectual gap. Of course the admiration is there, but it is subtle. Ajit is a writer and is allowed a slight paunch. The slightly clueless, pleasant expression that K.K. Raina mastered is the gold standard for me. Saswata Chatteree is rather good, too. His portrayal is largely matter of fact but displays a deep concern for his friend’s well-being, without adoring glances, thank goodness. The Byomkesh stories are thrillers, for god’s sake. They take polite Bengali middle and upper middle class stories and turn them inside out to reveal bloodthirsty violence, unbridled lust, drug running, blackmail and murder. They span from the inter-war years to the sixties when the nation and the city of Calcutta witnessed turmoil. Bombs fell on Calcutta; planes crashed at Bhowanipore; there were riots. This turmoil forms the backdrop of many of the Byomkesh stories. It is unrealistic to assume that a Merchant-Ivory like treatment is necessarily appropriate. Byomkesh and Ajit were resolutely middle class. They did not live in a grand mansion. Ever. They met in a boarding house in a dodgy neighbourhood just off Chinatown in Central Calcutta, moved to Byomkesh’s rented place on Harrison Road in the north, where he had a few rooms on the first floor, and eventually built a house together on Keyatala Road in the southern part of the city. Yes, the up and coming but back of beyond suburb of Keyatola, that hub of late Deco houses with large square balconies and cement mosaic floors. So can we have a little less of the baroque antique furniture and nineteenth century mansion setting for Byomkesh’s dwelling, please? I liked Anjan Dutta’s set for Byomkesh Phire Elo (Byomkesh Returns), replete with Byomkesh’s toddler’s scribbles on the wall at child height. A nice touch. As any detective story junkie will tell you, we are addicts and need our thrills fast. Bandyopadhyay was an old hand at screenwriting (he wrote quite a few Hindi films) and knew how to pace his stories really well. If the stories have been written to be a thirty minute read, there isn’t enough material there to drag it on for three hours. You’d be better off doing a mix of two or three stories, like Spielberg did for Tintin. (And like, we hear, Dibakar has done.) A couple of Byomkesh’s later stories are long enough for a feature film adaptation in their own right, but many are not. Byomkesh is happily married and shares his household with Ajit, who is a bachelor. Saradindu Bandopadhyay never shied away from sexuality as a writer. If any of the characters, whether major or minor, were gay, he would have written about it. The writer has kept the characters the way they are to create red herrings and the exact pace that he wants, not for any other agenda. A word in the director’s ear: when you interpolate unnecessary subplots of your own making, you take away from the suspense. If you are keen on a gay angle, don’t be lazy. Create a powerful gay detective or gay character in a fresh detective story. Please do not second guess a master of the genre. For all my complaining, there is no denying that Byomkesh Bakshi has come back to life like no other detective except for his inspiration, Sherlock Holmes. And I am secretly quite happy about this – delighted, actually. There is hope yet for the likes of nitpickers like me, Dibakar Banerjee, don’t let us down. Jash Sen is the author of The Wordkeepers and its sequel, Skyserpents.